The world of surreal botany has long remained hidden – since the 18th Century, this field of study was often derided even by trailblazing naturalists such as Carolus Linnaeus and Joseph Banks. The publishers of this book believe that the time for remaining ignorant of surreal botany has come to an end. 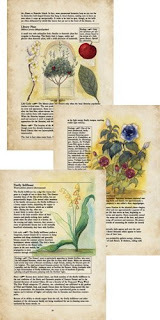 Personal safety alone would justify the information on some of these specimens coming to light, and readers will surely apreciate learning of the plants whose threats are lesser, or that are disappearing as the plants them-selves become more rare. this book may be read and appreciated by gardening enthusiasts, paranormal investigtors, and conspiracy theorists alike. While most of the science I blog about here is often on the cutting edge of biology - cloning, genetic engineering, synthetic biology - I also have a love for old-fashioned natural history illustration. While modern nature illustrations meld the artistic with the scientific, such drawings from the 16th century and earlier are often based on the artist's imagination rather than actual observations of plants and animals. But what if such fantastic flora actually existed? A Field Guide to Surreal Botany would be the catalog of those plants. Each flower has an "abyss probability" center, appearing black or colorless, where the forces of probability are most pronounced and neither stamen nor pistil are present due to inability to settle into a fixed physical shape. In the fading last moment of corporealis, the abyss probability black void momentarily glimmers with brilliant gold pinpoints of light as the light energy finally escapes, reaching visible light velocity. There are also Dream Melons that "play a vital role in the ecology of mirages in Arabian deserts", Bone Garden that "looks like a small human ribcage", and Time Cactus that reproduces by forming a narrow wormhole anchored at one end at the time of germination and the other anchored in the present. As to be expected with an anthology, I find some of the entries more compelling than others. However, overall it's an enjoyable book both to read and look at. 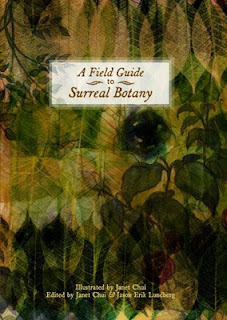 The Field Guide to Surreal Botany was edited by Janet Chui and Jason Erik Lundberg, and published by Two Cranes Press. You can order a copy through the official web site. * Contributed by Vera Nazarian, whose short story "The Story of Love" was on the 2007 Nebula final ballot.